Currently I'm concerned about incredible overheating of "Artificial Intelligence" boom in Japan - while "Data Scientist" has gone. 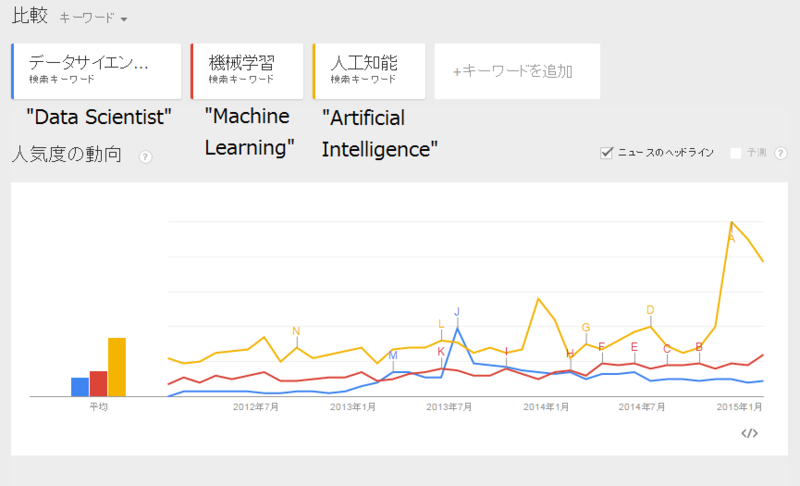 Google Trends shows Japanese people are getting just less attracted by statistics that is believed to be expertise of Data Scientist, and now they are enthusiastic about Artificial Intelligence. I feel this situation looks much puzzling. So, what's going on in 2015?... yes, I think not a few data science experts in Japan must agree that "Artificial Intelligence" explosively gets popular. Indeed we see a lot of media coverage whose title include "人工知能" (artificial intelligence in Japanese) almost every day. Google News Japanese edition shows as below. Google News Japanese edition: search result with "人工知能"
Even within a year there are too many media coverage titled "Artificial Intelligence". Google Trends clearly shows what's going on currently. Below is a search result from 2004 to now (Feb 2015). Focused on more recent situation, see below; from 2012 to now. "Artificial Intelligence" appears to be explosively rising since 2014 (more precisely, a larger peak rose at the beginning of 2015), although "Data Scientist" is going down since the highest peak at the summer of 2013. Interestingly, "Machine Learning" has almost the same meaning as artificial intelligence but it showed a gradual uptrend. I think it should be called as "Overheated Boom of Artificial Intelligence"... but you would say "Why? Why do you think it as an overheated boom?" As far as I've seen in all over media coverage, a lot of tweets or many posts in Facebook, it seems that most lay people don't know what artificial intelligence or machine learning is and perhaps they won't even try to understand it. In short, I feel Japanese (lay) people believe that "Artificial Intelligence is something great". This boom is now driving a lot of companies to start business with "Artificial Intelligence", however meaningless it looks... even they're much enthusiastic about Deep Learning as "almighty" artificial intelligence, although it requires precise tuning of numerous parameters (of course they don't know anything about it). I'm afraid that such a boom may shorten the life of REAL artificial intelligence or machine learning as business solution. The reason why I'm anxious about this nonsense boom of artificial intelligence is that I still remember how "Data Scientist" once got popular and went down. 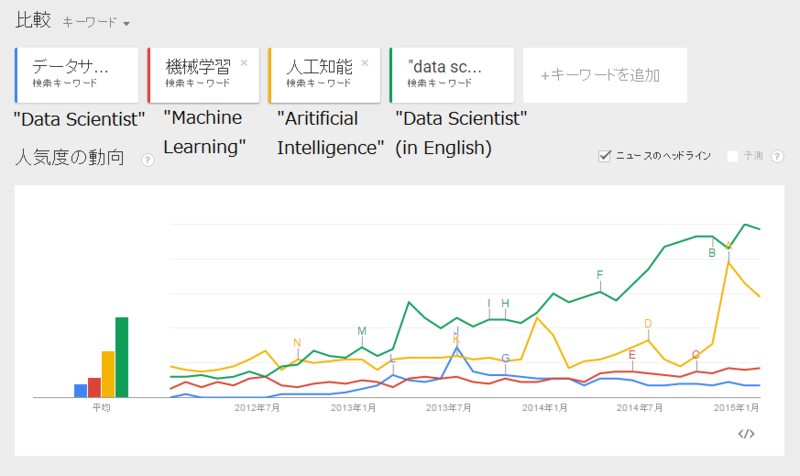 Although in Japan "Data Scientist" has gone, "Data Scientist" in English - it roughly means "global" situation - is still rising. 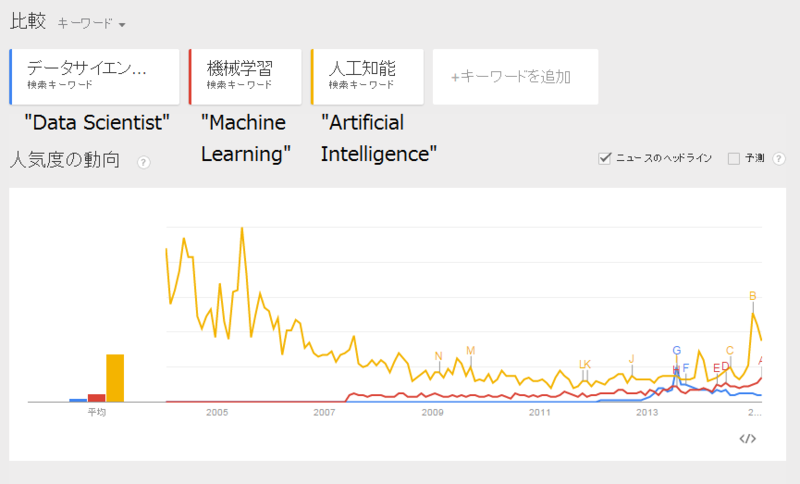 In Japan, people seem to get enthusiastic about "Artificial Intelligence" while "Data Scientist" has attracted less attention, even has been forgotten. For me it looks a serious gap between Japan and global community in data science field. You may wonder why "Data Scientist" is going down while she/he is also primary contributor of "Artificial Intelligence" or machine learning systems with a plenty of knowledge about data science including fundamental theory of machine learning... I think it's plausible, but some points should be considered; in Japan, Data Scientist is believed to be an expert in statistics, not machine learning. In other words, Japanese people are now less interested in statistics, and artificial intelligence (maybe not practical machine learning) is attracting them. The puzzling situation about "Artificial Intelligence", "Data Scientist" and "Machine Learning" in Japan may reflect it. I'm concerned about when the overheated "Artificial Intelligence" boom finishes.